Niche.com, a site dedicated to student reviews for colleges and K-12 schools, has named Belhaven University’s residence halls as the best in Mississippi. Belhaven’s residence halls were ranked 50th in the nation, outpacing schools such as Emory, Princeton and the University of Chicago. The ranking is based on key statistics and student reviews from the website. Top ranked colleges offer outstanding on-campus housing that is safe and clean with modern amenities at reasonable prices. Earlier this year, Belhaven opened the $9 million state-of-the-art Robbie and Dudley Hughes University Village. 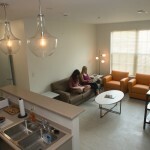 The apartment-style residence hall offers many amenities normally absent from on-campus housing, such as full kitchens, private bedrooms, a fitness center and more. Belhaven University has had some big moments over the past few weeks. Belhaven celebrated Homecoming, and recently partnered with the University of Mississippi for a dual enrollment engineering degree. In addition, Belhaven University has earned several prestigious accolades. U.S. News and World Report recently released its “Best Colleges” edition, and for the third consecutive year, Belhaven has been named among the Top Regional Colleges in the South. U. S. News also rated Belhaven among the top colleges offering online bachelor degrees and the top colleges for veterans. Additionally, Belhaven has been recognized for three consecutive years as a Military Friendly institution by Victory Media. For the 12th consecutive year, Belhaven was named one of America’s Best 100 College Buys. This honor recognizes the university for its affordability and financial aid availability to its students. Over ninety percent of Belhaven students receive some form of student financial aid, that allows them to fulfill their desire to earn a Belhaven degree. Belhaven was also named one of America’s Best Christian Colleges by Instructional Research and Evaluation.